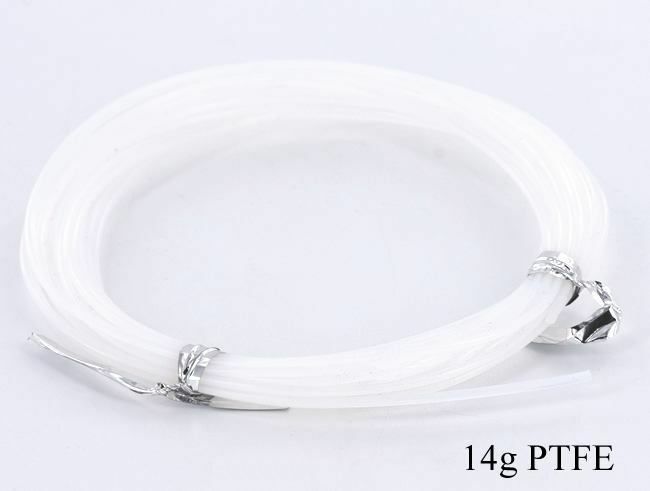 You will receive a 5 meter-long coil of clear translucent 14g PTFE (almost 16 long'). This is perfect for shops, because you can cut the PTFE to length for your customers, making it more economical than buying single PTFE shafts and throwing away excess when you cut them down. Plus, it's autoclavable and hypo-allergenic, making it a perfect material for those with sensitive skin. PTFE is flexible and soft, so it's comfortable, too. You can replace the barbells in your navel jewelry, straight barbell shafts, eyebrow rings, and many other types of jewelry with PTFE to make your jewelry more comfortable to wear. PTFE is technically self-threading, so you should be able to just screw on an externally-threaded ball and go. Depending on the balls you're working with, it sometimes works out better to use a PTFE threading tool, though (order tool here).